If you live in Missouri you are probably aware of the fact that, within our state, is the New Madrid fault, a 150-mile long fault that covers portions of five states, including the New Madrid are of Missouri. The New Madrid fault zone was the location of three (or some say four) of the largest earthquakes ever recorded on this continent, reaching a magnitude as high as 7.0 – 7.5. These massive earthquakes occurred at the end of 1811 and beginning of 1812. What you may not know, is the impact an earthquake in New Madrid may have on your home in the St Louis area. 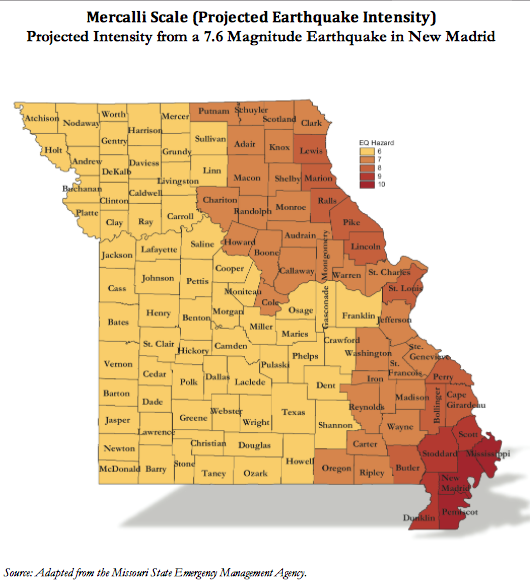 The State of Missouri Division of Insurance just released it’s “State of Earthquake Coverage” report for 2015 which is filled with information every homeowner in the eastern portion of the state should be interested in. As the map below shows, the damage from an earthquake in the New Madrid area would reach all the way to the northern most part of our state, in the eastern portion of Missouri. Therefore, for homeowners throughout the area, earthquake insurance should be strongly considered. Unfortunately, as the report shows, the cost of earthquake coverage in this area is much higher than other parts of the state due to the higher risk. 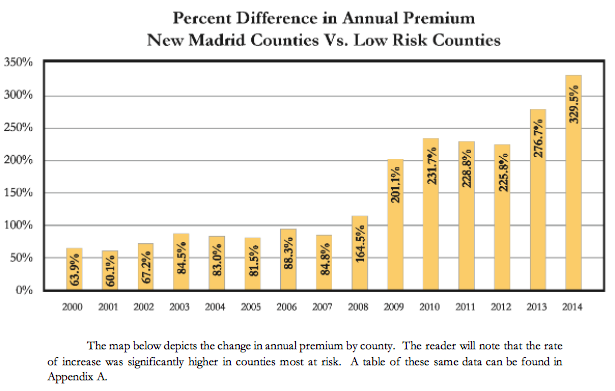 In fact, as the table below shows, earthquake coverage in the New Madrid counties is 329% higher than in low-risk counties of Missouri.